Welcome to the Sewing Escape! 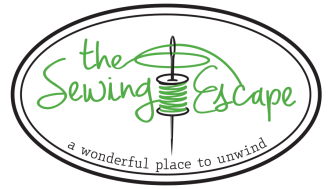 The Sewing Escape is Orange County’s premier stitching lounge, where anyone can come to unwind & get away. The Sewing Escape offers longarm quilting services, one-on-one sewing instruction, group workshops & classes, sit & sew (work on your own project as much or as little as you want) time and unique fabric selections. Work on your own or gather a group of your friends and join in on the fun and make sewing a daily escape for yourself. Simply complete our 2 hour training course taught on our Innova Sit Down stitch-regulated machine. You will learn the following skills: - machine set up and basic operation of the machine - thread basics and threading the machine - winding a bobbin - starting and stopping the machine - quilting techniques The course will be one-on-one. It will include a large quilt sandwich to practice stitching on. At the end of the class, certification will be issued if The Sewing Escape instructor determines that the student has a thorough understanding of the skills required to operate the machinery. This course will be scheduled upon request. If additional time is needed, the cost is $25 per hour for a on-on-one session.